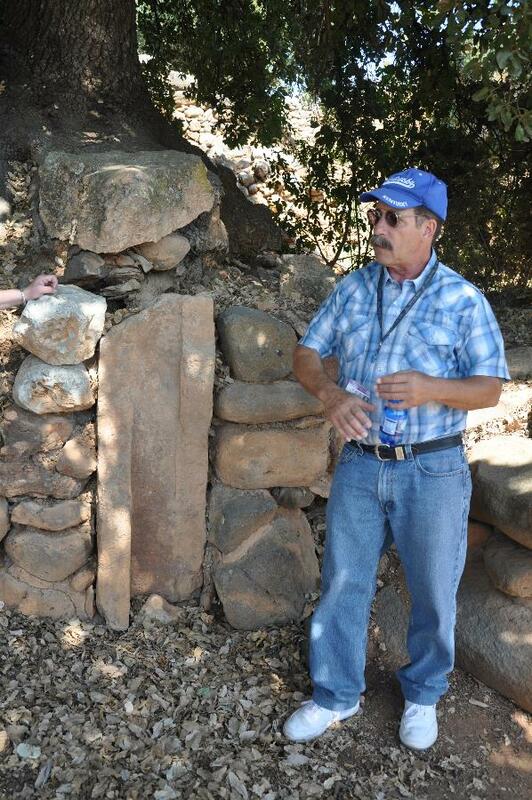 Ferrell Jenkins (May 31) wrote a very fitting tribute to Eliemelech Ben Meir, a guide he has used in Israel for two decades. Elie died May 23, following a stroke. Also Barry Britnell (who is currently leading a tour in Israel) made a nice post here. I also wanted to share a few memories of Elie, whom I first met in 1999. 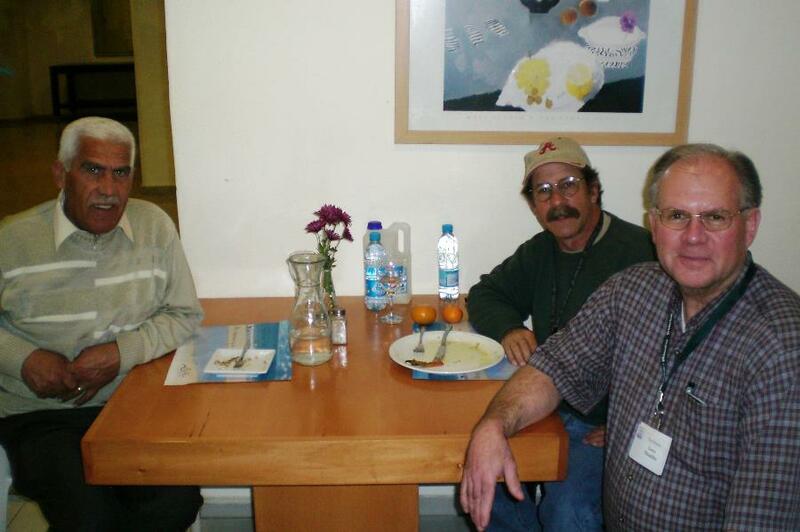 I began taking groups to Israel in 2009. I never considered asking for any guide except Elie. He and driver Fawzi were close friends. Elie always wanted to be sure I put in a request for Fawzi to be our driver. At Natanya, Israel. Fawzi, driver at left, and Elie, center. Photo ©Leon Mauldin. I selected a few photos from this past Oct. 2013, that are from a variety of places. At Dan, the northern most city in ancient Israel, and the site of Jeroboam’s shrine, which was condemned by faithful prophets. Elie at Dan. Photo ©Leon Mauldin. 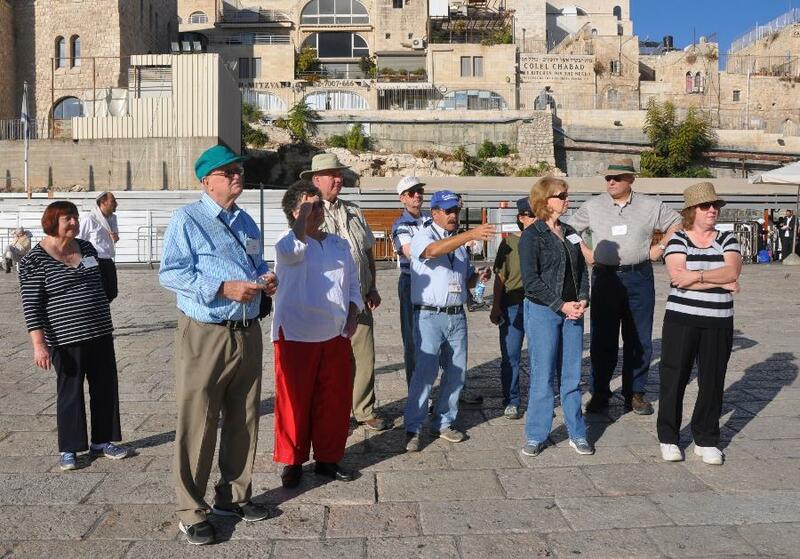 In Jerusalem our group saw the “wailing wall.” At our approach to the site Elie was giving info and instructions. Elie instructing our group as we neared Wailing Wall. Photo by Gary Kerr, ©Leon Mauldin. 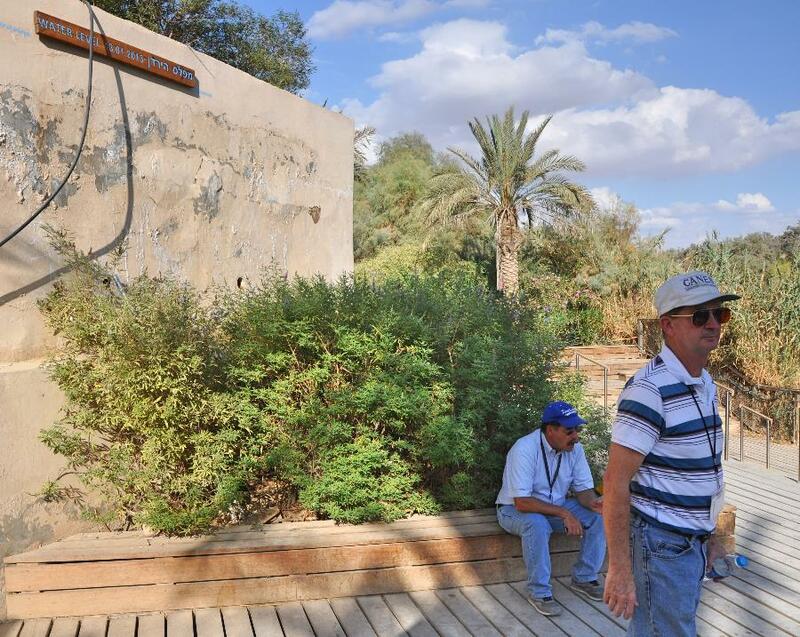 At the Jordan River, at the traditional site of the Jesus baptism, there is a high water mark for Jan. 1, 2013. Though the Jordan does not flood as it did in biblical times (see here), it still gets well out of its banks at times as this photo shows. (click to enlarge photo; see info on board upper left). Upper left shows high water mark reached Jan 2013. Elie is seated; tour member Keith Crews is at right. Photo ©Leon Mauldin. Of course Masada has tremendous historical significance. 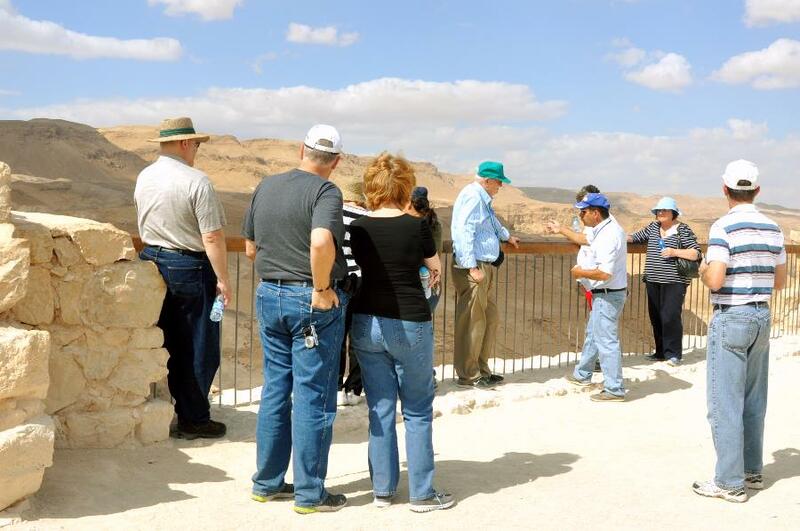 Elie instructing our group at Masada. Photo ©Leon Mauldin. At Masada in particular Elie would remind everyone to bring their water. This sampling also represents somewhat of the tremendous variety within the land of Israel itself. Elie was versatile and well equipped to help us very literally “from Dan to Beersheba.” I hate to say goodbye to old friends. He will be missed. This entry was posted on Tuesday, June 10th, 2014 at 4:59 PM and is filed under Bible History and Geography, Friendship, Israel, photography, Travel. You can follow any responses to this entry through the RSS 2.0 feed. You can leave a response, or trackback from your own site. Thanks for another great tribute to Elie. He will surely be missed. Please also keep Fawzi and his family in your prayers, his Mother passed away today. See Barry’s blog post from today for details. Van, Thanks very much for your comment. This is sad I know you will really miss him! Great memories of him, he taught me soooo much!Thanks for sharing pictures! Thanks Sandy. So glad you travelled with us to Israel, and share the good memories.